Back in October 2010, I joined an on-line cooking group, French Fridays with Dorie, whose goal was to cook its way through a single cookbook, Around My French Table, one recipe each week. The group worked off of the same schedule with everyone cooking the same recipe, posting about that week’s selected recipe each Friday. This marks my final post about this project. The group cooked the final recipe four weeks ago. I finished making up the handful that I’d missing, completing the final four earlier this week. For the past three weeks, we’ve been sharing our favorite recipes, techniques, and reflections about the cooking confidence we’ve gained along the way, courtesy of Around My French Table and its author Dorie Greenspan. For the final post, rather than more about the book, I want to share my reflections about the French Fridays group instead. I started blogging in October of 2009, a year before French Fridays started. Like so many others, I used my blog as a place to share what I was cooking with my family and friends. I’m addicted to cookbooks but I’ve barely made a dent in trying more than a few recipes for any one of them. 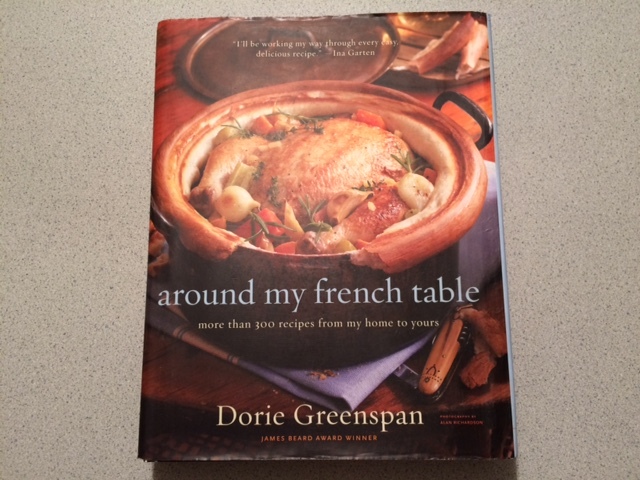 When I heard about French Fridays with Dorie gearing up to start, I was intrigued by the idea of cooking every single recipe in one book. The selected recipe cut down on a few decisions I’d have to make each week: one thing to cook and one thing to write about. So I joined and started when the group cooked the inaugural recipe: Gougeres. Each week, I enjoyed reading the other group members'(Doristas’) posts and comparing their process and outcome with mine. Some were novice cooks, some were advanced, some managed food allergies in their family, or eating preferences, or dietary restrictions. The variety of experiences and the creativity to make each recipe work in their own kitchen inspired me. It took me a while to catch on that commenting on these strangers’ blogs was a welcome, not creepy, exchange. And so, slowly, conversations started. Through typed conversations each week, many friendships developed. I called the Doristas my “imaginary friends”. Each week I got a glimpse into their lives, and they into mine, and we started to know each other. French Fridays has been filled with a diverse group of home cooks, mostly from North America, but sprinkled with others from all over the world. The Doristas shared my passion for food. They were all enthusiastic cooks, just like me. As the weeks and months went by, Friday posts went beyond the recipe of the week. We shared more of our lives: travel adventures, books read, new cookbooks discovered, family joys and sadnesses. It was more like sharing stories around the water cooler in the office, getting to know your co-workers. Being a Dorista became less of a solitary pursuit and more of a group activity. September 2013 sealed the deal. The International Food Blogger Conference was scheduled in Seattle. 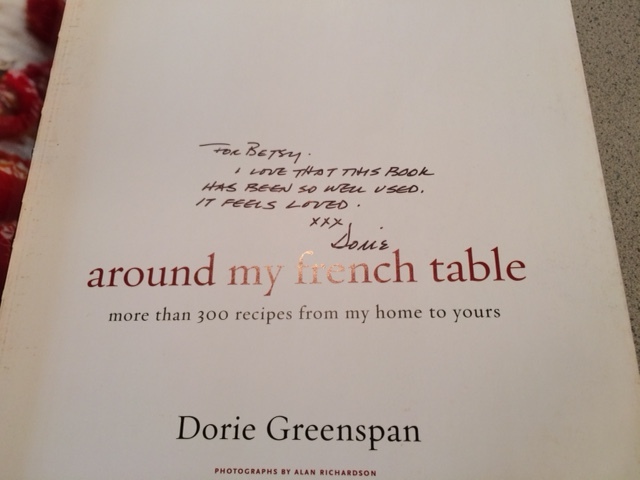 Dorie Greenspan, our unofficial leader, as author of this book we were cooking through, was the keynote speaker. Many of the Doristas planned to attend. I was one of them. At the conference, a magical bonding took place, transforming the group dynamics, turning imaginary friends into real ones. In fact, since the conference broke the ice, if an opportunity to meet up with another Dorista arises, it has become de rigeur. And now the project we set out to do has been completed. I’m proud that I stuck with this and did the whole book. I’m equally proud of the community we’ve built together. More than the cooking, what I marvel at are the friends I made along the way. The project might be over, but I’ll be keeping in touch with my new friends. From a blogging perspective, it’s now time to step back and figure out what to focus on next. I have no idea what it will be, but do know that my blogging has been enriched and will continue to be inspired by the bloggers I met and follow through the French Fridays community. I would be remiss if I didn’t offer a huge thank you to Dorie herself for writing this book that was the catalyst for the creation of French Fridays. Dorie, it was delightful to find that you are as gracious, elegant, and kind in person as you seem from your voice encouraging from the page every week. It’s been a treat to meet you, and I hope to see you again in the future. And so, my Dorista friends, as I wrap up this last look at what we’ve done together, thank you for being my companions along this incredible and unexpected journey. I will miss our weekly catch ups, but I look forward to keeping up with whatever your future adventures turn out to be, continuing the conversations, the recipe exchanges, and the book recommendations. Who knows, maybe we’ll even take on another project together. More than anything, I’m so happy that our paths have crossed and I have gotten to know you. To read the grand finales of the other Doristas, check out their links here. 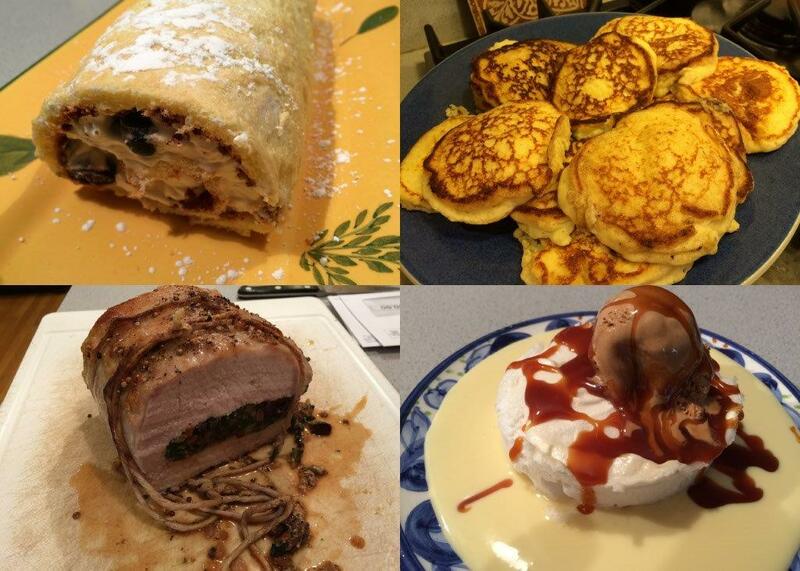 When the French Fridays group completed the final recipe in Around My French Table last month, I had 6 recipes to make up. As of last week, I was down to four — so close that it seemed ridiculous not to be sure and finish up before the last celebratory week was over. I’m proud to report that as of today — I did it! Two of the recipes were made back in December 2011, right around the time when I was hosting a huge party to celebrate my 50th birthday. The Swiss chard-stuffed pork loin and matafan (fluffy mashed potato cakes) always seemed like the perfect foundation for a special occasion dinner or to serve to company. For several months afterwards, this pair of recipes was always in the back of my mind, and then I just forgot about them. 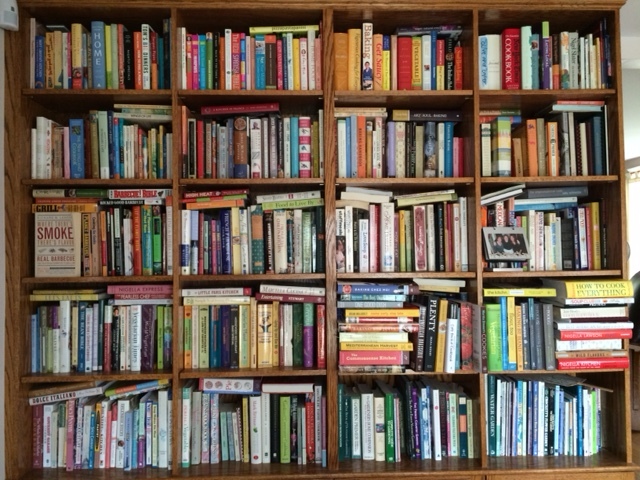 When I reviewed the list of recipes completed, there they were, just waiting. Finding ourselves home unexpectedly for dinner last Saturday night, I decided it was now or never. 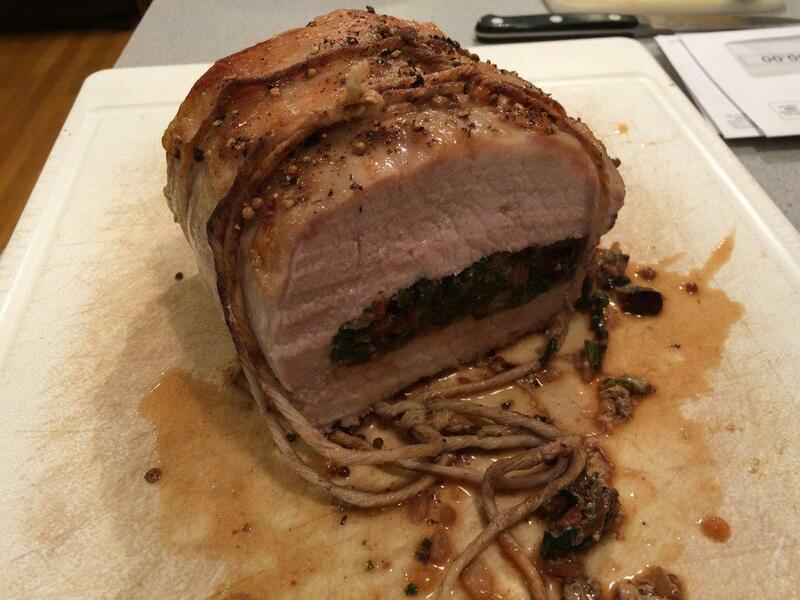 The pork loin is butterflied and stuffed with a slightly spicy mixture of Swiss chard cooked with garlic and onions. The recipe calls for a burst of sweetness in the form of raisins, but someone in my house would object (I’m looking at you, Howard), so I used my standard stand-in for raisins in savory dishes — oil-cured olives — instead. The trickiest part of this dish was tying the stuffed roast. I watched several different videos, but they all went too fast. In the end, I managed something that worked, even if it lacked the elegance of the video’s final product. The roasted pork loin looked impressive with its swirl of green. While it rested, I cooked the matafan. 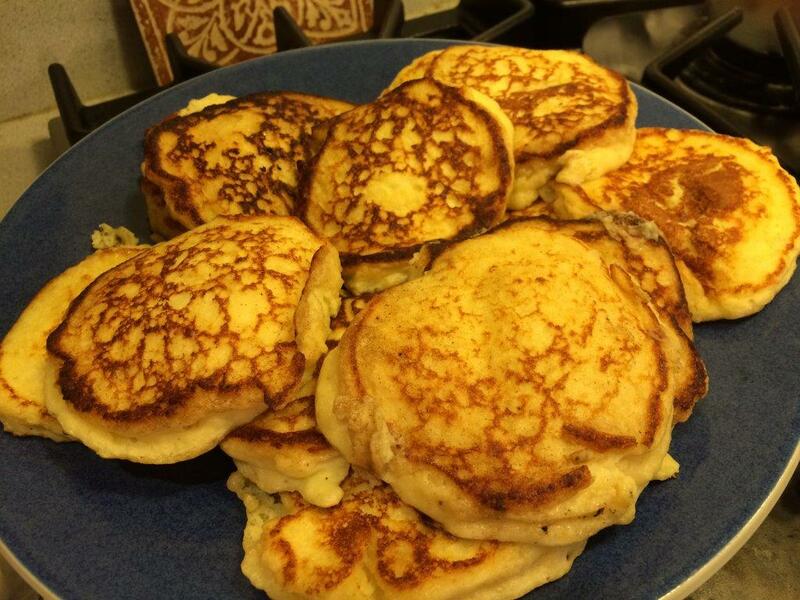 These fluffy potato pancakes were completely different from the latkes I make from shredded potatoes. The whipped egg whites made them much lighter, and they easily cooked up in a small amount of butter, rather than the sea of oil that latkes are fried in. I rounded out the meal with raw, freshly picked sugar snap peas from our garden. It was a delicious meal, even if we weren’t celebrating anything, except maybe being nearer to completing all the AMFT recipes. I would make the pork roast again, maybe playing around with different fillings, or even trying the same filling to stuff a leg of lamb. The potato pancakes are worth remembering too. The final two recipes remaining were desserts that I couldn’t get that excited about the first time around. They were desserts that I knew that Howard wouldn’t try. I’ve learned about “minify-ing” or should we call it “Mardi-fying”, but I wasn’t that inspired. Again, it was now or never. 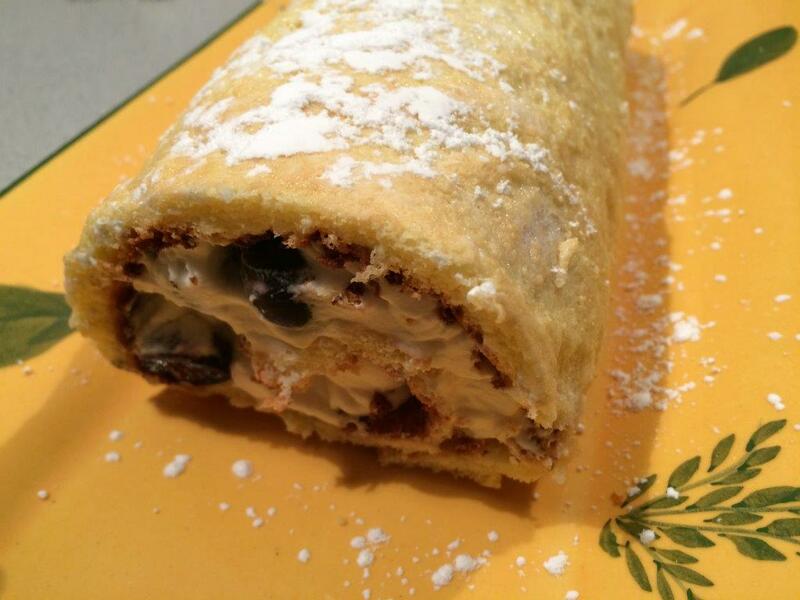 I had a meeting to go to on Monday night, so I motivated myself to make a half-sized Blueberry-Mascarpone Roulade. This is a sponge cake rolled around a whipped cream and mascarpone filling dotted with blueberries that were slightly cooked in a light syrup and topped with a heavy dose of confectioners’ sugar. The stumbling block here is that I’ve never been a big fan of whipped cream. I’ll admit that the roulade makes a stunning presentation. My favorite part was the blueberries, or maybe even the syrup, which I’ve been using to flavor seltzer water. With strawberry season upon us, I could see making this with strawberries for a fancy version of strawberry shortcake. The blueberry version was a bit hit with my colleagues at the meeting, but I’m not sure I’d make this one again. And finally (drum roll please), the last recipe to make was Floating Islands. I was definitely NOT excited about this one. 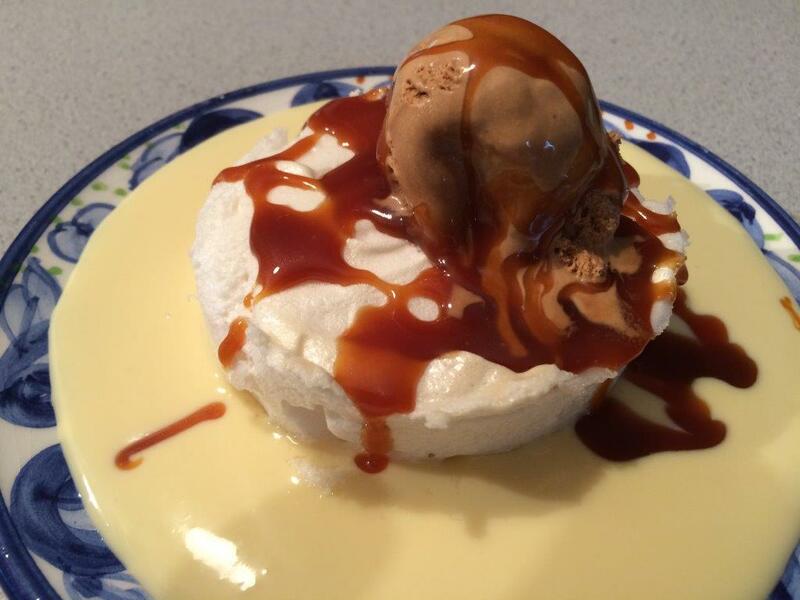 It just isn’t the kind of dessert I eat: meringue served on a sea of crème anglaise topped with ice cream and your choice of caramel or chocolate sauce. Last summer, when I met up with some of the Doristas in New York, I ordered it for dessert just to see what it was. It was OK, but I still wasn’t wow-ed. However, how could I let floating islands stand between me and an “Incomplete” on this project to complete an entire cookbook? So I just sucked it up. I made a half batch of the crème anglaise and a single baby meringue. I topped the island with a scoop of sea salt caramel ice cream and some warmed fleur de sel caramel sauce. Voilà! You know what? It wasn’t half bad. I was pleasantly surprised. I impressed myself with the presentation — borderline restaurant worthy. It was a lot of work to serve just one, and given that I know Howard won’t eat it, I’m not sure I’d make it again. I will admit that I enjoyed it much more than I thought I would. And with that, I have completed all the recipes in Around My French Table. Whew! I don’t know if I thought I really would. Stay tuned on Friday for my final installment reflecting on this multi-year project that now comes to an end.